So today is the last day in KC before I head off to Junior Nationals. I have to say that I am super excited; this will be my first year doing this race and the road race seems to have a pretty nasty five mile climb that we get to do a couple of times, which should make for some good climbing fun. I know most of the guys who are going so it will be cool to see all my friends from California and Arizona. In order to get there early so I could preview the course with Kenny we are shipping out bright and early at about five o’clock in the morning. Unfortunately for my dad that means he will have to get up and be ready to roll early, but for me… well my Dad was kind enough to set up this sweet pad so that I could sleep on the way over to Madison, Wisconsin. 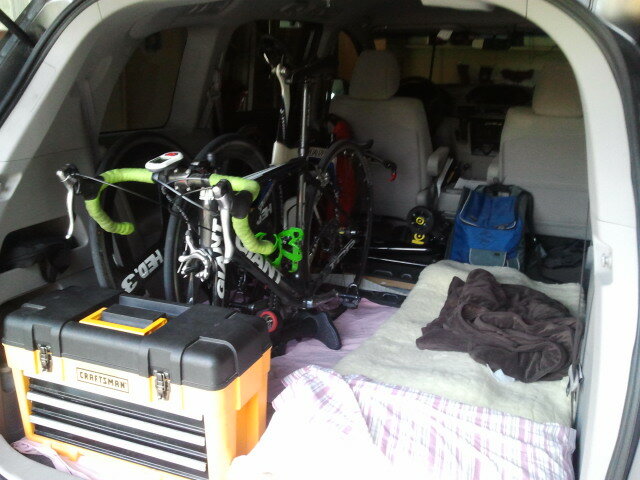 As for today it was all about packing and recovering for my first event, which is the time trial. So I hooked up with Rick for a quick little spin. Now its all about sleep so that I am good to go for tomorrow. I will try as best as I can to keep everyone updated on how things go so stay tuned. ← I Wish All My Rest Days Had The Tour de France On: How About Pierre Rolland?